With 2012 coming to an end many property investors are asking where are the best property investment opportunities for 2013. Residex released their dwelling statistics for September which showed prices to have risen in the month. Theirsreports are useful because they also show how each city has performed over the past decade, and they provide some useful statistics on housing affordability. 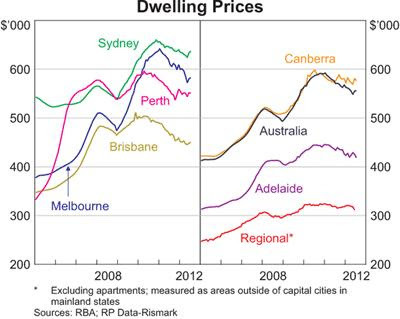 The picture below is sourced from the Reserve Bank’s chart packs and shows dwelling price movements excluding apartments by capital city from 2004 to the middle of 2012. So where are the best prospects for 2013 and beyond? Residex has shown that Sydney has comfortably been the worst performing capital city over the past 10 years (showing just 3.5% average annual capital growth), and the chart above illustrates that despite a boost in prices through the financial crisis, overall performance has been relatively weak since the last major boom in prices through to early 2004. Counter-cyclical investors therefore should look to Sydney for some of the best capital growth opportunities over the next 10 years. The Residex numbers do, however, show that there is an affordability issue for houses in Sydney and therefore apartments in the inner- and middle-ring suburbs may offer the best potential for growth over the next decade. Many have been surprised by the resilience shown by the Melbourne property market over recent months. The city undoubtedly has great fundamentals for the long term with a diverse range of industries and strong projected population growth. But even the biggest optimist would have to say that if you bought now you have probably missed the best of the boom following the tremendous appreciation in prices of around 35% through 2009 and 2010. Melbourne showed incredible capital growth from 2007 to 2011 and it seems extremely unlikely to me that such strong growth will be seen again over the coming decade. Brisbane has been a notable underperformer over the past half-decade since 2007, especially with confidence having been dented by a little by the flooding in the city, but the property markets will turn the corner at some point and offer some opportunities for counter-cyclical investors. Being the cheapest mainland capital city in which to buy a house some of the best opportunities lie in this sector of the market, particularly in some of the established, supply-constrained suburbs. Western Australia has not only shown the strongest population growth in Australian states of late, it has also contributed very strongly to the nation’s GDP growth due to its resources focus. With low unemployment and low vacancy rates in certain suburbs, although Perth has not shown any dwelling price growth since the phenomenal boom in prices up to 2007, the fundamentals do seem to be aligning for the years ahead.Perth represents a good bet for those intent on riding the boom in mining capital investment. Adelaide has been a slow but steady performer in the past, but has not shown much growth since 2007. As population growth is not forecast to be as strong as in some other cities, the cities prospects may be likely to continue in a similarly steady vein. Houses are relatively cheap as compared to other capital cities, which offers some immediate potential for growth, and the larger blocks in some areas of the city offer great subdivision opportunities. Supply appears to be meeting demand in the housing market so the immediate potential for growth does not look great from my perspective. There may be some opportunities in the apartment market but overall very strong growth in the city does not look likely in the immediate future. It is undeniable that Darwin is showing oustanding growth at the moment, and there is every potential that this may continue with vacancy rates being so critically low. Despite what anyone may tell you, the prevailing high prices do mean that the potential for fast gains come with a risk premium attached. Sure, while the economy and GDP continue to grow so solidly dwelling prices may continue to forge ahead strongly, but if the economy takes a turn for the worse, so might dwelling prices in Darwin. Tasmania has shown weak population growth over recent years and therefore is not on my watch list. Hobart is the cheapest capital city in Australia in which to buy a house and it offers decent rental yields in some areas – and therefore this attracts some mainland investors. Not one for me. Since 2008 I have been mainly buying in Sydney. My opinion hasn’t changed in that I think Sydney will be the best performer on a risk-adjusted basis over the next decade, particularly now that Melbourne seems to have done its dash. I would certainly consider buying a house in Brisbane in the coming years too. Obviously, property investors don’t ‘buy the market’; investors buy individual properties, so it is important to find the outperforming sub-markets and property types. Undoubtedly Darwin, Perth or any number of regional markets might show stronger capital growth than Sydney, but investment returns should always be measured on a risk-adjusted basis. It is important to consider what might happen if Australia slips into recession and particularly if there is a commodity price meltdown. Remember that an awful lot can happen in a decade.